A Tariqa (or tariqah; Arabic: طريقة‎‎ ṭarīqah) is the term for a school or order of Sufism, or especially for the mystical teaching and spiritual practices of such an order with the aim of seeking Haqīqah, which translates as "ultimate truth". The metaphor of "way, path" is to be understood in connection of the term sharia which also has the meaning of "path", more specifically "well-trodden path; path to the waterhole". 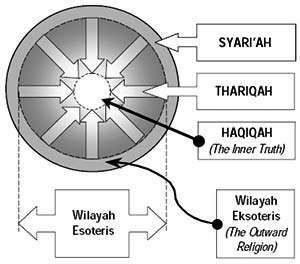 The "path" metaphor of tariqa is that of a further path, taken by the mystic, which continues from the "well-trodden path" or exoteric of sharia towards the esoteric haqiqa. A fourth "station" following the succession of shariah, tariqa and haqiqa is called marifa. This is the "unseen center" of haqiqa, and the ultimate aim of the mystic, corresponding to the unio mystica in Western mysticism. Tasawwuf, Arabic word that refers to mysticism and Islamic esotericism, is known in the West as Sufism. "Tariqat" in the Four Spiritual Stations: The Four Stations, sharia, tariqa, haqiqa. The fourth station, marifa, which is considered "unseen", is actually the center of the haqiqa region. It's the essence of all four stations. The most popular tariqa in the West is the Mevlevi Order, named after Jalāl ad-Dīn Muhammad Rūmī. In the same time the Bektashi Order was also founded, named after the Alevi Muslim saint Haji Bektash Veli. The four main tariqas in South Asia are: the Naqshbandi Order, named after Baha-ud-Din Naqshband Bukhari; the Qadiri Order, named after `Abd al-Qādir al-Jīlānī; the Chishti Order, named after Khawaja Mawdood Chisti while Khawaja Moinuddin Chishti is the most famous sheikh; the Suhrawardi Order, named after Shahab al-Din Suhrawardi. Others can be offshoots of a tariqa. For example, the Qalandariyya has roots in Malamatiyya (with Buddhism and Hinduism influence) and Wafa'i (a combination Yasawiyya-Sunni and Batiniyya-Shi'a) of orders are offshoots of the Suhrawardi order. The Maizbhandari Tariqa or Maizbhandari Sufi Order is a liberated Sufism order established in the Bangladesh in the 19th century by the Gausul Azam Hazrat Shah Sufi Syed Ahmadullah Maizbhandari. (1826 AD − 1906 AD), 27th descendent of the Islamic prophet, Muhammad . Membership of a particular Sufi order is not exclusive and cannot be likened to the ideological commitment to a political party. Unlike the Christian monastic orders which are demarcated by firm lines of authority and sacrament, Sufis often are members of various Sufi orders. The non-exclusiveness of Sufi orders has consequences for the social extension of Sufism. They cannot be regarded as indulging in a zero sum competition which a purely political analysis might have suggested. Rather their joint effect is to impart to Sufism a cumulant body of tradition, rather than individual and isolated experiences. In most cases the sheikh nominates his khalīfa or "successor" during his lifetime, who will take over the order. In rare cases, if the sheikh dies without naming a khalīfa, the students of the ṭarīqa elect another spiritual leader by vote. In some orders it is recommended to take a khalīf from the same order as the murshid. In some groups it is customary for the khalīfa to be the son of the sheikh, although in other groups the khalīfa and the sheikh are not normally relatives. In yet other orders a successor may be identified through the spiritual dreams of its members. Tarīqas have Silsilas (Arabic: سلسلة‎‎) "chain, lineage of sheikhs". Almost all orders except the Naqshbandi order claim a silsila that leads back to Muhammad through ‘Alī. 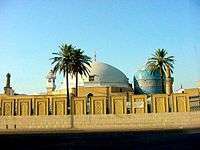 (The Naqshbandi Silsila goes back to Abu Bakr the first Caliph of Sunni Islam and then Muhammad ibn Abi Bakr. Historians however have traced this chain back to ‘Alī as Muhammad ibn Abi Bakr was brought up by ‘Alī from the age of three.) Many other silsilas contain the names of Shī‘ah Imams. Every Murid, on entering the ṭarīqa, gets his 'awrād, or daily recitations, authorized by his murshid (usually to be recited before or after the pre-dawn prayer, after the afternoon prayer and after the evening prayer). Usually these recitations are extensive and time-consuming (for example the awrād may consist of reciting a certain formula 99, 500 or even 1000 times). One must also be in a state of ritual purity (as one is for the obligatory prayers to perform them while facing Mecca). The recitations change as a student (murid) moves from a mere initiate to other Sufi degrees (usually requiring additional initiations). The Initiation ceremony is routine and consists of reading chapter 1 of the Quran followed by a single phrase prayer. Criteria have to be met to be promoted in rank: the common way is to repeat a single phrase prayer 82,000 times or more as in the case of Burhaniyya, a number that grows with each achieved rank. Murids who experience unusual interaction during meditation: hear voices like "would you like to see a prophet?" or see visions who might even communicate with the Murid are held dear in the "Haḍra" (Arabic: حضره ), the weekly group-chanting of prayers in attempt of reaching spirits as they are likely to experience something unusual and pass it on. This Murid is promoted faster than others. The least common way is to cause a miracle to happen with criteria similar to that of Catholic Sainthood. Being mostly followers of the spiritual traditions of Islam loosely referred to as Sufism, these groups were sometimes distinct from the Ulma or officially mandated scholars, and often acted as informal missionaries of Islam. They provided accepted avenues for emotional expressions of faith, and the Tarīqas spread to all corners of the Muslim world, and often exercised a degree of political influence inordinate to their size (take for example the influence that the sheikhs of the Safavid had over the armies of Tamerlane, or the missionary work of Ali-Shir Nava'i in Turkistan among the Mongol and Tatar people). The tariqas were particularly influential in the spread of Islam in the sub-Sahara during the 9th to 14th centuries, where they spread south along trade routes between North Africa and the sub-Saharan kingdoms of Ghana and Mali. On the West African coast they set up Zāwiyas on the shores of the river Niger and even established independent kingdoms such as al-Murābiṭūn or Almoravids.The Al Hakika Mizaan Mizaani Sufi Order deals with heavy internalization and meditations, their spiritual practice is called Al Qudra Mizaan[(United States)] The Sanusi order were also highly involved in missionary work in Africa during the 19th century, spreading both Islam and a high level of literacy into Africa as far south as Lake Chad and beyond by setting up a network of zawiyas where Islam was taught. Much of central Asia and southern Russia was won over to Islam through the missionary work of the Tarīqahs, and the majority of Indonesia's population, where a Muslim army never set foot, was converted to Islam by the perseverance of both Muslim traders and Sufi missionaries. Tariqas were brought to China in the 17th century by Ma Laichi and other Chinese Sufis who had studied in Mecca and Yemen, and had also been influenced by spiritual descendants of the Kashgarian Sufi master Afaq Khoja. On the Chinese soil the institutions became known as menhuan, and are typically headquartered near the tombs (gongbei) of their founders. Leading Islam's military and political battles against the Christian West, as far back as the Qadiri order of the 12th century. ↑ Michael Dillon (1999). China's Muslim Hui community: migration, settlement and sects. Routledge. pp. 113–114. ISBN 0-7007-1026-4. One of Dillon's main sources is: 馬通 ( Ma Tong) (1983). 中国伊斯兰教派与门宦制度史略 (Zhongguo Yisilan jiaopai yu menhuan zhidu shilue) (A sketch of the history of Chinese Islamic sects and the menhuan system). Yinchuan: 宁夏人民出版社 (Ningxia Renmin Chubanshe). Clayer, Nathalie, Muslim Brotherhood Networks, EGO - European History Online, Mainz: Institute of European History, 2011, retrieved: May 23, 2011. PHILTAR (Philosophy of Theology and Religion at the Division of Religion and Philosophy of St Martin's College) has a very useful Graphical illustration of the Sufi schools.